Tamara is the Chief Executive Officer of Palma Consulting, a firm that has been providing business and information technology consulting services from its Amman head office for over 15 years. She is a Certified Management Consultant, with expertise in strategy, corporate governance, performance management, and business development and was previously the Chair of the Jordanian Institute of Management Consultants and Trainers. Tamara has contributed greatly to business innovation and entrepreneurship in the Middle East and Northern Africa region and Forbes Middle East voted her as one the Most Powerful Arab Women in 2014. Dwight is the founder and President of Effective Managers™, a management consulting firm based in Canada and providing services on a global basis. He works with organizations to improve performance through manager effectiveness, ensuring that all are focused on key strategic priorities and have the necessary accountability and authority for success. 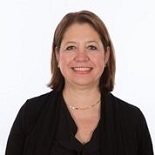 Anca is a Certified Management Consultant and the founding manager of GROWHMSELF, a company specialized in financial and performance improvement, project management and organizational consulting. Anca has more than fifteen years of international management consulting experience with a strong component on project consulting and local development, holding an MBA in project and process management. Wilton is a Certified Management Consultant, Chartered Certified Accountant, Certified Internal Auditor, and Certified Fraud Examiner. He also holds a BSC in Public Administration and an MBA. He has consulted widely in finance, risk and fraud, and lectures at the undergraduate and postgraduate levels. Pamela Campagna (Marketing Committee Chair), President, BLUE SAGE Consulting, Inc.
Pamela is a Certified Management Consultant, and President of BLUE SAGE Consulting, Inc., a woman business enterprise specializing in strategy, business optimization and resource development. Pamela believes that learning, understanding and productivity are connected within the classroom and across organizations. As a Professor of Practice at HULT International Business School, Pamela teaches courses in marketing, strategy and leadership to a diverse global postgraduate audience. Jon is a Fellow Certified Management Consultant, Certified Health Executive, Chartered Professional in Human Resources, and Business Excellence Expert. He was the Chair of CMC Canada’s National Certification Committee and a member of the Board of Directors in 2017/2018. His areas of interest include human resources, governance, organizational excellence, and project management. Abdullah is Director of Learning & Development at Knowledge Group and Director of Leadership Programs at GP Strategies based in UAE and covering 19 countries MENA region. Working with more than 25 global partners, Abdullah has developed his expertise in understanding clients’ requirements, designing learning solutions, steering programs, execution and implementation. Abdullah is a Certified Management Consultant, Certified Global Human Resources Professional, Project Manager, Learning & Development Senior Certified Professional, and holds a Masters in Business Administration degree. Otto is a CMC with more than 20 years of experience in operational efficiency and business performance improvement, providing assistance through a wide array of specialties. He is an Industrial Engineer with an MBA (Human Resources major), Double Certified in Lean Six Sigma by ASQ (CSSBB), and was Senior Advisor at Deutsche Post International Training. He leads EXYGE.COM, a strategy and operations management consulting company based in Costa Rica (Central America) and serving the Latin American market. Reema holds a BA degree in Economics and Statistics and Political Science from the University of Jordan and is accountable for implementing the strategic plan of CMC Global’s Board, with a focus on improving programs and services that are required for growth. She was previously the Executive Director of the Institute of Management Consultants and Trainers of Jordan (IMC-Jordan), prior to which, she worked at an information technology company for 15 years, holding positions of increasing seniority, including as Training Center Manager.